Dhanush can be seen with Vetrimaaran in the photo. Tamil star Dhanush recently took to Twitter and a photograph from the sets of his eagerly-awaited ‘Vada Chennai’. 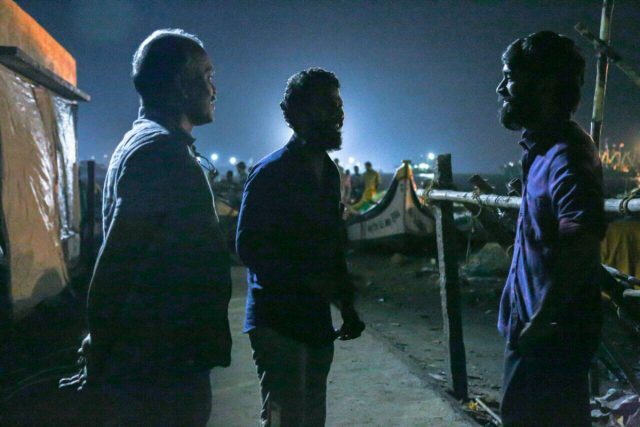 In it, the National awarded winner can be seen discussing something with director Vetrimaaran. The two seem to be in a relaxed mood here and seem to be enjoying each other’s company lot. While sharing the pic, D said his association with Vetrimaaran began on the sets of ‘Polladhavan’ and is still going strong. He went on to add that he hopes to continue this partnership and keep learning new things together. “10 years ago dis day polladhavan released. Our journey continues as a team 2 explore nd learn together. From d sets of vadachennai right now,” he wrote. Well, we wish Dhanush the very best and hope that the film turns out to be a big success. In case you did not know, ‘Vada Chennai’ is touted to be a gangster drama and is the first part of a trilogy. In it, D will be seen alongside Andrea Jeremiah and the much-loved Aishwarya Rajesh. Sometime ago, Aishwarya revealed that she had held fish in her hand during the shoot. “We shot in many dirty and clumsy areas. We shot in Kasimedu’s slum area, and fish market; I even held fish in my hand and mingled with several locals, which was a different experience altogether,” she had added. On a related note, this is a busy time for Dhanush. Besides ‘Vada Chennai’, he also has ‘The Extraordinary Journey of The Fakir’ and ‘Maari 2’ in his kitty.